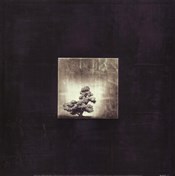 Bonsai tree art is a unique art category because it is essentially artwork that depicts art. These small trees are manipulated, pruned, and grown by man to be very small. Because the art of bonsai growing is an ancient Asian art, many of the bonsai tree prints are treated and depicted in the same way as Asian art prints. The word 'bonsai' means 'tree in a container' and the symbolism of Asian bonsai tree images is one of the most illuminating forms of Asian art prints available to art audiences today. In many ways bonsai tree paintings represent the qualities that Asian culture has traditionally striven for in their artwork. Bonsai trees are symbols of meditation, orderly thought, and all other good mental practices. 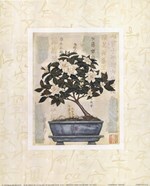 As such bonsai tree art is, in many ways, the image of a perfect mind and soul, as lauded in Asian culture. 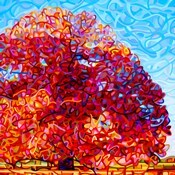 Many of the examples of bonsai tree art are contemporary tree images. These works try to modify the traditional of Asian art prints and translate them into a form of natural plant painting that is modern while still keeping to the Asian aesthetic. Works like the 'Bonsai' art series by Charlene Audrey and 'Bonsai Poets Tree' by Om highlight this form of contemporary tree image by combining graphic designs with traditional stylistic devices. 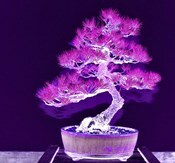 Bonsai trees are cultivated and manipulated by man, however, these amazing images are considered natural plant paintings. Although their significance is primarily cultural, these delicate plants are one of the most unique forms of natural plant images because of their development and appearance.